How to get there: The best access is from Ytre Kandal on the west side of Breimsvatnet. In order to reach this small farming community, drive north (from Bergen) on E-39, or south from Møre og Romsdal along the same Hwy. From Eastern Norway one can travel across to Stryn, then along Nordfjord's south side to Utvik and across the mountain to Byrkjelo where you will find E-39. Assuming an approach from/via Byrkjelo, continue to the small village of Breim and further in the direction of Sandane. You will have the lake Breimsvatnet on your left. Immediately after the lake ends, look for a sign going left with the name Kandal. This road will take you across the river from Breimsvatnet and then south-east along the west side of the lake. At Lyngneset, the road turns more south (slightly west of south), continue for about 2 km to the small farm community called Ytre Kandal. Just after crossing the river in Ytre Kandal, a small dirt road forks right. This is the road to Ytre Kandalsstøylen. There is a self serve toll station, pay 20 crowns and continue as far as the road permits. In winter, it is likely best to park at the first available turnout that leaves the road open to other traffic. This toll station can also be used to pay for the usage of the mountain hut Ovebu (see below). In summer, it is likely that one can drive passenger cars up to Ytre Kandalsstøylen (approx. 500 meter elevation). 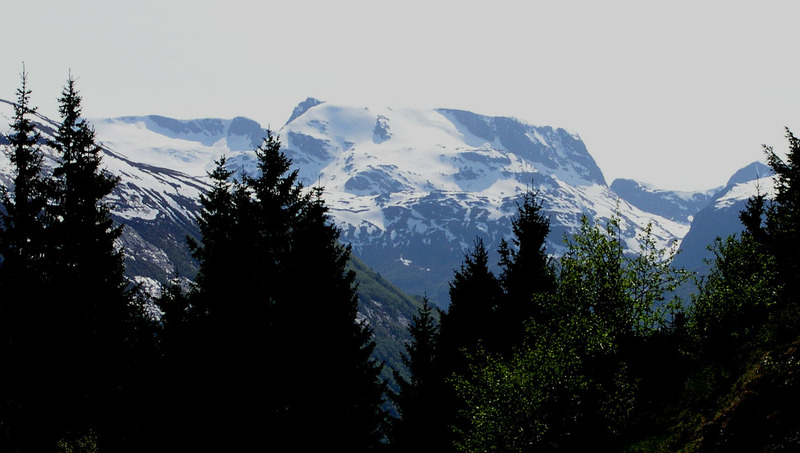 Route description: Hike (or drive) from Ytre Kandal to Ytre Kandalsstøylen. Just before the road crosses the river, the route turns directly south into the narrow valley Sørsendalen. (The lower part of which is also called Botnen.) There is a sign just where the trail leaves the road, reading 1.5 hours to Øykjeheia and 3 hours to Blåegga (this is the local name for Botnafjellet). The summer route is marked with red "T's" and climbs the east side of the valley to Øykjeheia, then continues up the north-east ridge/shoulder of the mountain. The rest of this description is based on our winter climb. 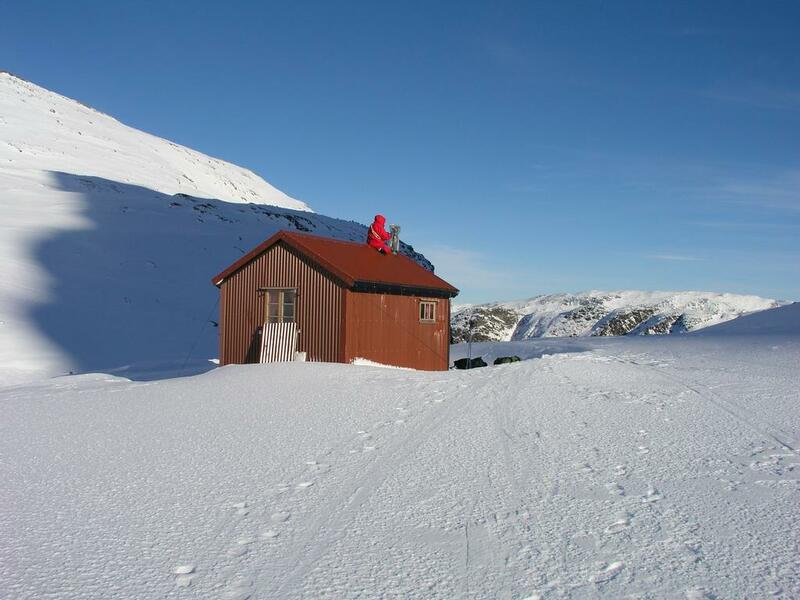 The trip can be made in one day, however, in winter it may be quite a good option to stay one night at the small mountain hut called Ovebu. Ovebu is located just a few hundred meter north-east of the first Sørsendalsvatn (918 m). This hut is open, but one should arrange with Ove Kandal in advance (his phone number is +47-57867535). In 2003, the cost was 150 Norwegian crowns for one night. One can arrange to pay this together with the road toll. In winter, the avalanche situation is EXTREMELY important for this hike. 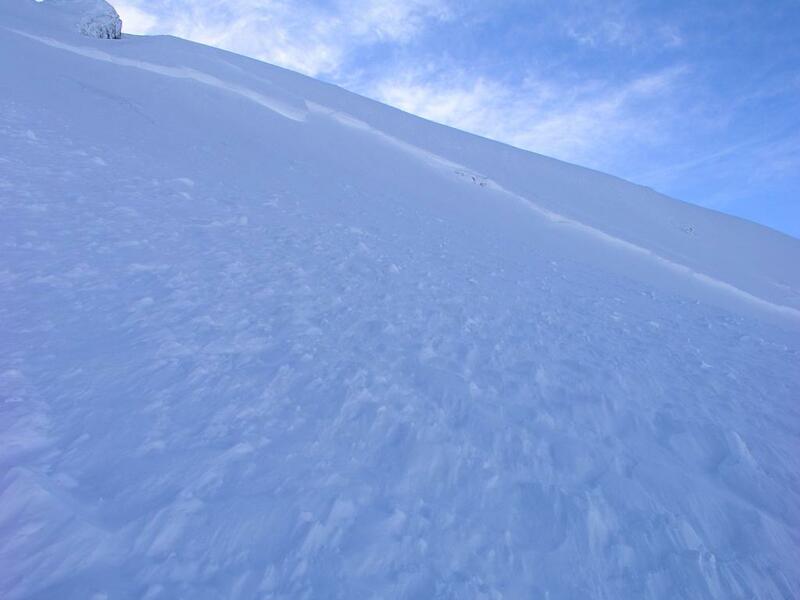 The route is in avalanche terrain and one should be absolutely certain that the snow is stable. Avalanches can occur at any time throughout the winter, but the danger is often smaller very early in the winter, before any substantial snow has accumulated and also very late in winter (spring) when the snow has consolidated and many of the seasonal avalanches already have taken place. DO NOT ski this route after a recent storm or substantial snowfall. From Ytre Kandalsstøylen, ski about 2 km south, then south-west into the lower part of Sørsendalen (also called Botnen). 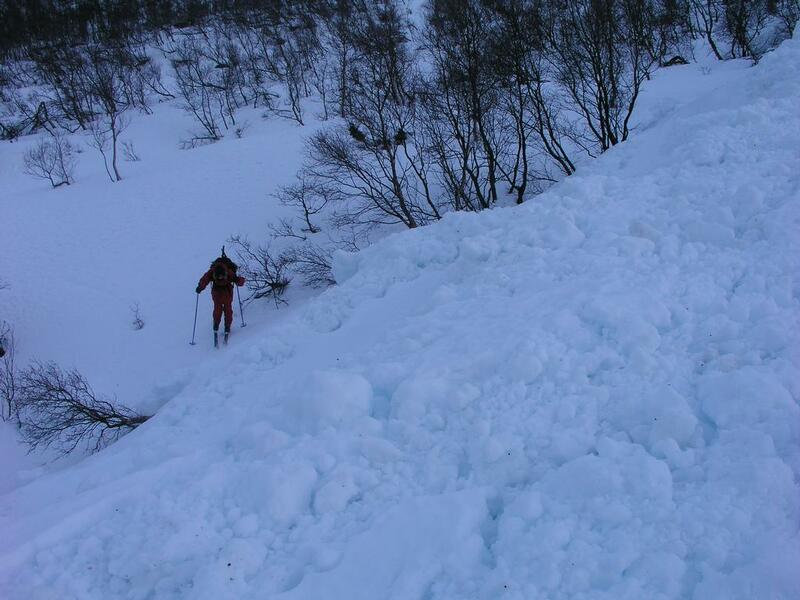 In February 2003 a huge avalanche had released from the lower north slopes of Botnafjellet, it stretched across the valley floor (see the pictures below). Thus, it may be safer to stay on the right (west) side of the creek, however an avalanche of this size can kill anywhere across the valley, since a powerful shock wave will be present (This shock had broken sturdy trees like small matches). The valley then narrows and the terrain climbs, also in this section there are avalanches, we spotted two that had released on the north slope, they ran down into the valley, then followed the creek a considerable distance downwards. Thus, the clear advice is to stay halfway up on the right (north) side of the valley. DO NOT ski along the creek as long as this can be avoided. To make things complicated, there was also a smaller avalanche from the steep, south side cliffs, however the danger from this side appears to be smaller. In summary, there is NO avalanche "safe" route up this valley. If the snow conditions are unsettled, cancel your plan and find another mountain. Higher up, the valley becomes very narrow and it may be difficult to avoid its lower part. Depending on the conditions one can ski more or less straight up staying mostly on the left (south) side of the creek, or one can climb the slope on the north side, and leave the very distinct valley. In this latter case, one will arrive directly at the hut Ovebu, if the creek is followed one should turn right as soon as the first lake comes into view and it is possible to make a gentle uphill just beyond the small cliff that has been on the right hand side. 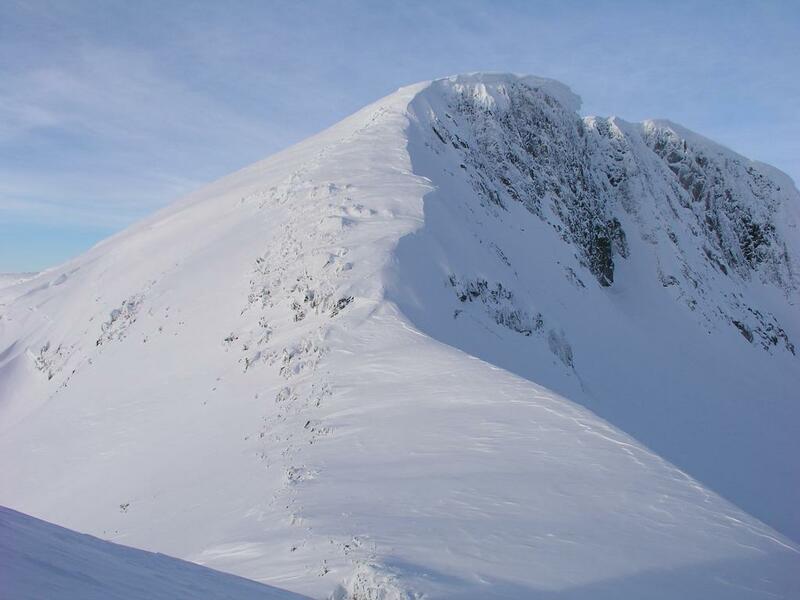 There are two routes from Ovebu to the summit, a short direct climb and a longer tour that also includes Blåegga, the distinct ridge going south. The first route has avalanche danger, while the second route involves a short, but steep ridge as well as being much longer. This description will cover both alternatives as we made the "tour de Blåegga", an option to be recommended. 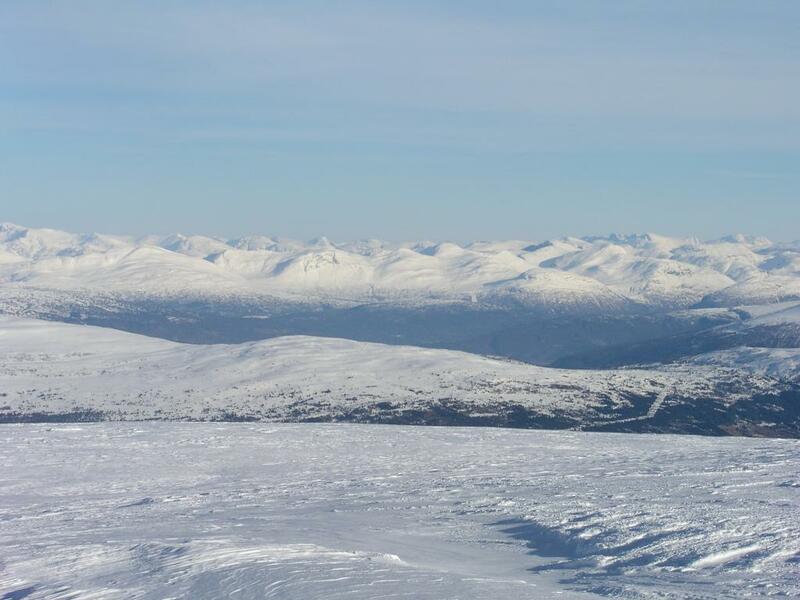 From Ovebu, ski directly (west) towards the larger Sørsendalsvatn (928m) and turn south into the wild valley between Botnafjellet and Sørsendalsegga. 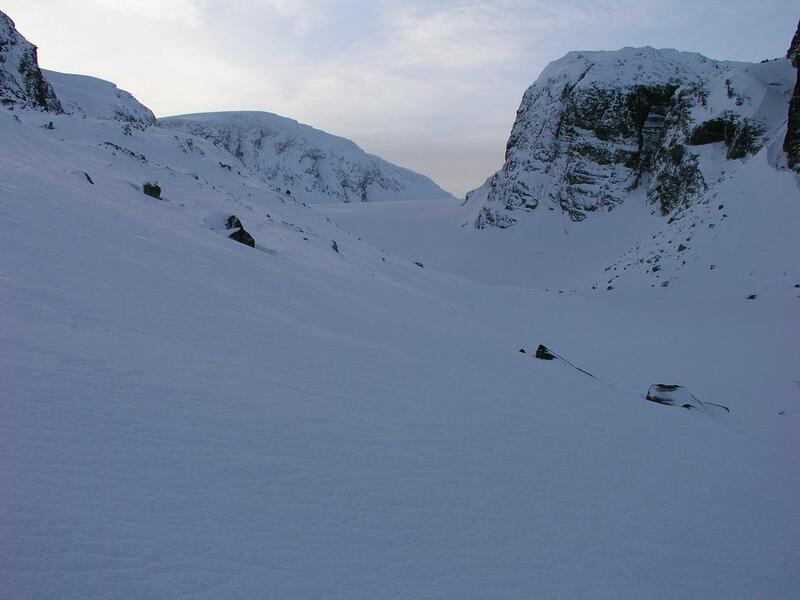 Climb the gentle slope of the Blåbreen glacier, be aware that this is a glacier and that (hidden) crevasses may pose a danger. Continue south on the glacier to its very highest point in the distict saddle between Kupefjellet (west) and Blåegga (east). There is an impressive view south from this saddle, the Trollekupa lakes being just below you. From this saddle, climb the ridge to Blåegga. The best line is likely just left of the boulders that can be seen. 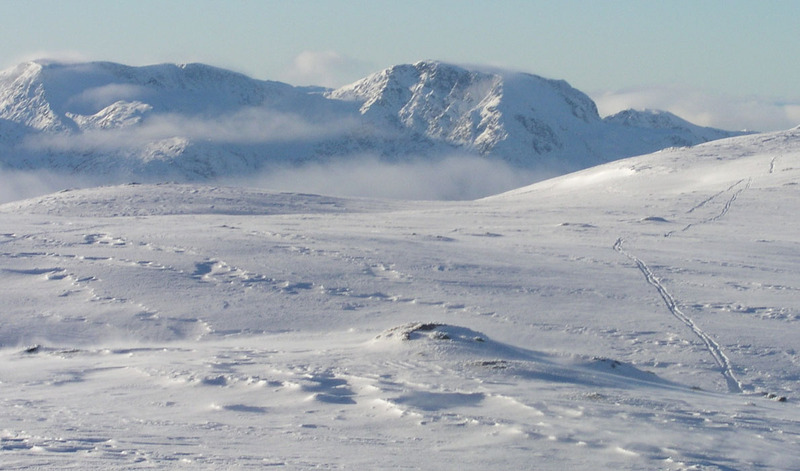 Depending on the snow conditions one may need crampons and ice axe here. The skis should be carried. YDS class 3 terrain in winter (Class 2 / 2+ in summer?). 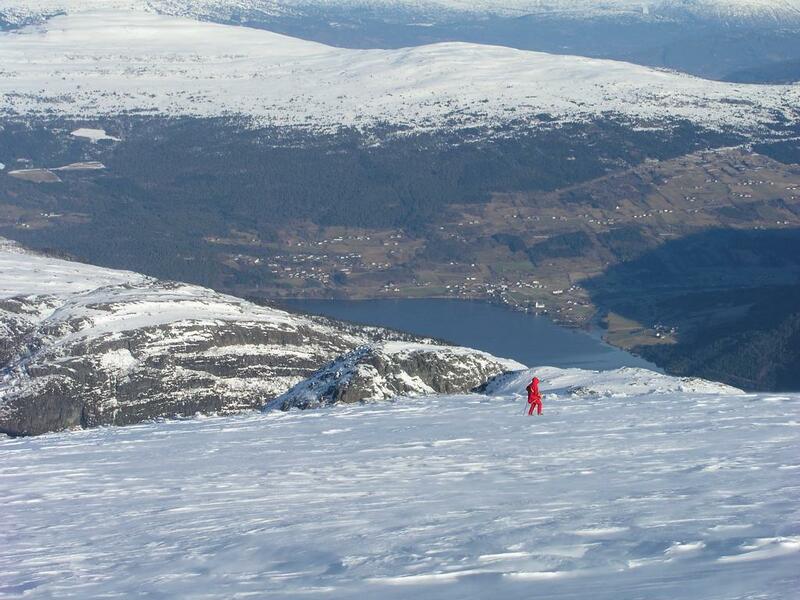 Higher up, the slope decreases and one can continue on skis to the highest point of Blåegga (1530m). 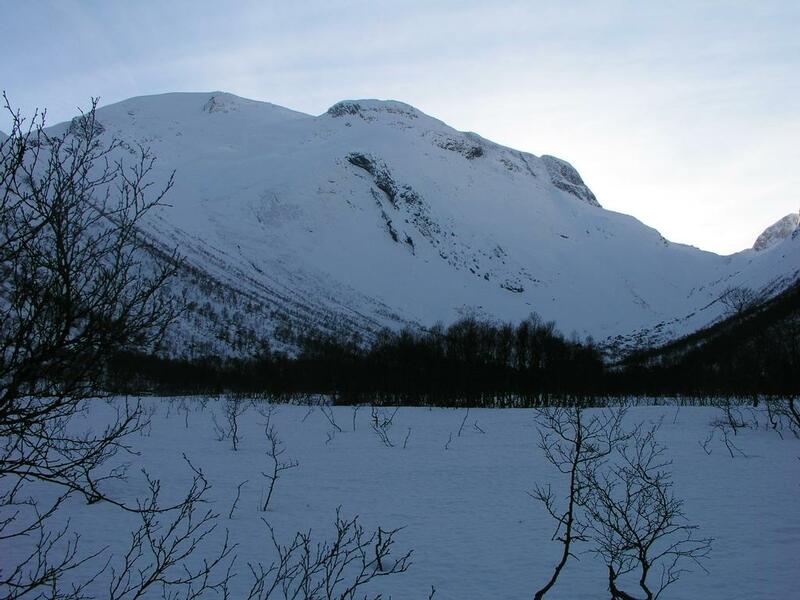 Blåegga has a primary factor of 140 meter to Botnafjellet, thus ranks as a separate mountain. From here, the skiing down to the connecting saddle and further up to the cairn at the summit of Botnafjellet is straightforward. Take care and stay away from the steep cliffs on either side. The view from this summit is absolutely outstanding, the mountain landscape extends in all directions. From the summit, there is a route that can be skied directly down the north side. The upper part of this route is steep and we found a fracture line that had triggered avalanches almost across the entire slope. Unless this slope is judged stable, one should use the longer route across Blåbreen. Locate the flat area marked 1290m on the map and descend above it. Once there, continue west in the slopes between moraines down to the lower Sørsendal lake. Comments: I did this climb with my son Pål Jørgen, age 13, and my friend Jan-Frode Myklebust. It took us 3 hours to hike/ski from Ytre Kandal to the hut Ovebu, the return the following day only 1 hour and 10 minutes. We started from Ovebu the next day at 0845 and reached the summit at 1215. We had blue sky, sunshine and a fantastic view in all directions. Despite some wind along the way, we had almost none at the summit. The return directly down to the hut took about 30 minutes mainly because of the hard crust at the upper part of the steepest slope that we walked down instead of skiing. The local community including a trail sign at Ytre Kandalsstøylen call this mountain Blåegga, not Botnafjellet. Over a period of 17 years, the guestbook in Ovebu had not recorded any visits in the period December 6. to March 31. Most seasons, there are no visits between September and June. From this it seems reasonable to believe that extremely few ascents have been done in the "winter period" December 21. to March 21. The massive avalanche from the north slope of Botnafjellet (east of point 1290) and into (and across!) Sørsendalen is among the largest I have ever seen. The avalanche stretched at least 300 meter out on fairly flat terrain in a width of about 300 meter, the average depth was likely about 5 meter with many local spots closer to 10. This corresponds to almost half a million tons of snow. Sturdy birch trees that the avalanche did not reach were broken violently by the shock wave in front of the snow. Our route took us near altogether six different avalanches, an extremely high number in any area. Any winter skiing in this terrain must consider the weather and the snow conditions with the utmost care! Botnafjellet seen from the road to Utvikfjellet 31. May 2003. Botnafjellet seen from Storfonn, November 6, 2004. The edge of the big avalanche, note the size already here. 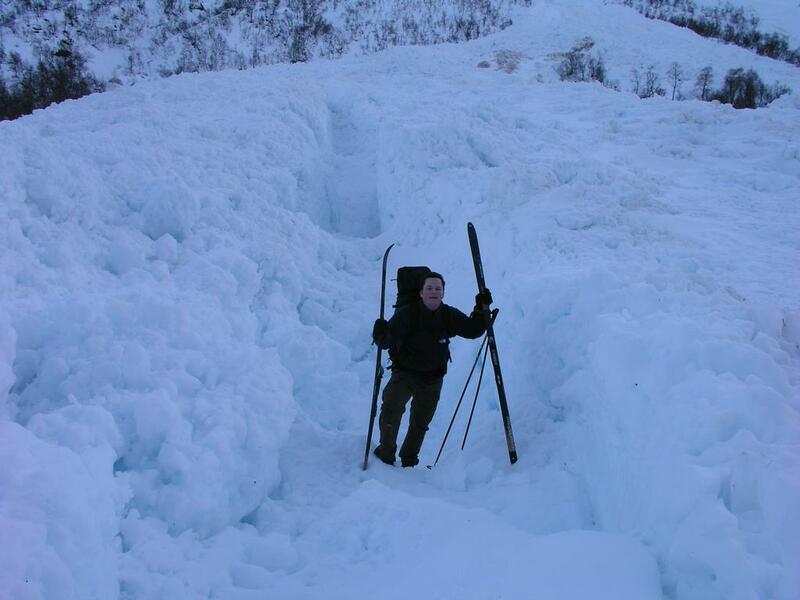 The avalanche, Jan Frode is crossing a small part. Botnafjellet, as seen from Ovebu. Our ski descent started high on the left and ran diagonally down in front of the rock face. The Blåbreen glacier, our route of ascent follows the glacier from its lowest to the highest end. Botnafjellet, as seen from Blåbreen. The ridge from Kupefjellet, descending this ridge is likely the easiest way from the DNT hut Longevasshytta on the south side. This ridge is much easier (less steep) than the ridge up to Blåegga that must be climbed. The glacier tops out in the saddle between these two ridges. 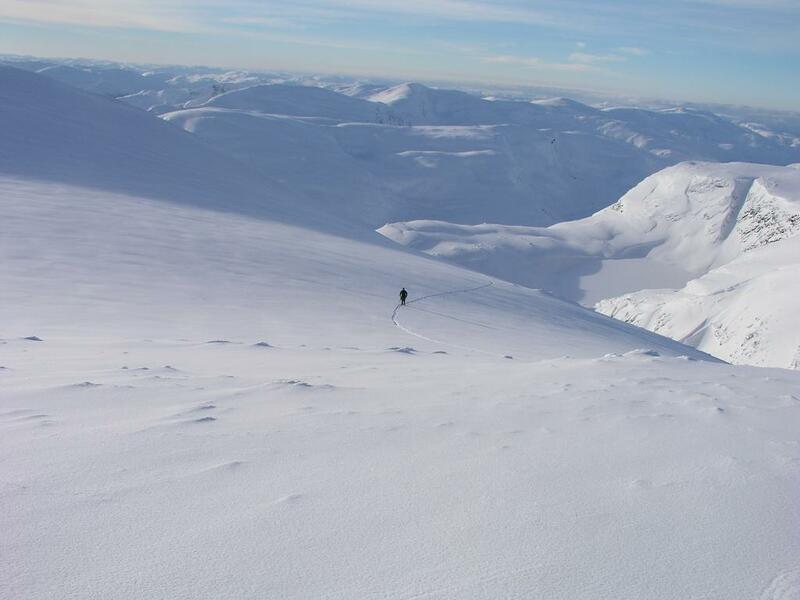 Jan-Frode, skiing up to Blåegga. Panoama view from west to north. View north-east, this picture continues the previous panorama. 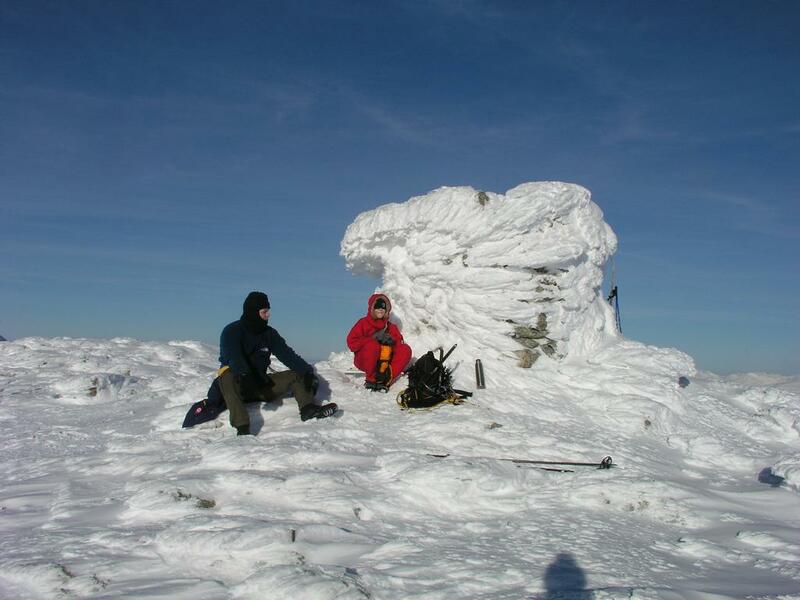 The summit cairn, we have a good rest. Pål Jørgen has started the descent, the village of Breim is 1.5 vertical km below. Avalanche country, the fracture lines from two recent avalanches crossed most of the slope. The Ovebu hut, Pål Jørgen is preparing the departure.